Welcome to carefree condominium living at Timberlake! 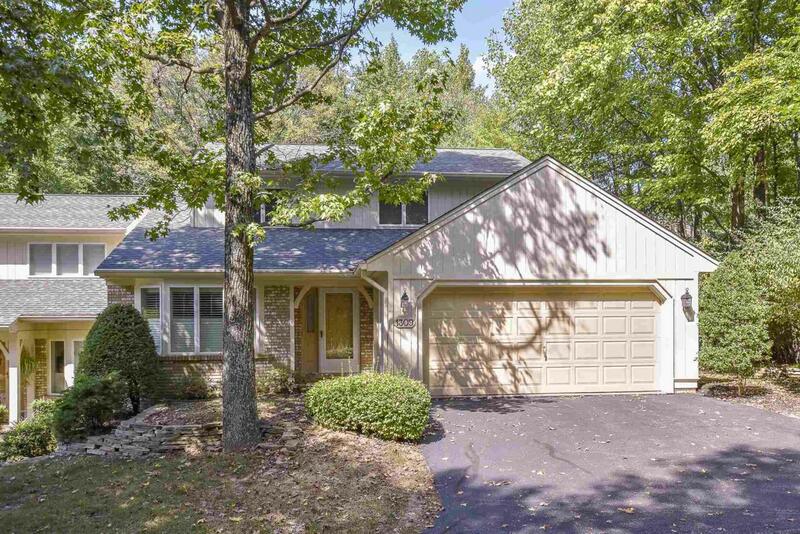 Located on Evansvilles north side, just minutes from shopping and the conveniences of city life, yet offering a country setting with walking paths through wooded surroundings, and a lake containing a peaceful water fountain. This high-end custom 1.5 story condo home has a main level Master Suite and bright white Kitchen with a bay window, and space for a table and chairs on the hardwood floor. The foyer, also with hardwood, leads you to the vaulted ceiling Great Room with Dining area that creates a huge room ideal for entertaining. The Den with custom cabinetry and a cozy gas log fireplace is adjacent to the Master Suite and connected to the Great Room by the tiled Sunroom that provides easy flow and more open gathering space. The Sunroom with two skylights in the vaulted ceiling leads to a private outdoor space with a large patio with spigot for a gas grill, and a view of the woods. The Den can be closed off from the Sunroom and the Master. The Master Suite has built-in cabinets, and two walk-in closets, plus two baths, one with a garden tub, and one with a shower, and both with a vanity. The main level also features plantation shutters, a half bath and a laundry room. The second level has two bedrooms, and a shared full bath. There is plenty of closet and storage space and a new air conditioner was just installed. The monthly dues cover the grounds and lake, and the buildings including the gutters, roofs (not skylights), mailboxes, and termite prevention. Home warranty included.